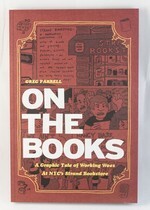 Greg Farrell is a cartoonist and rapper whose other works include the comics Attaboy, Brendon: A Coming of Age Story, Going Rate, and the illustrated prison diary of Ho Chi Minh. He works at Strand bookstore. He lives in Brooklyn. by Greg Farrell, Dan Méndez Moore, Mia Partlow, Nate Powell and Super Pack!